Drink from the fountain of eternal life as The Immortals from Universal Pictures, is released on DVD and Blu-Ray, March 6. 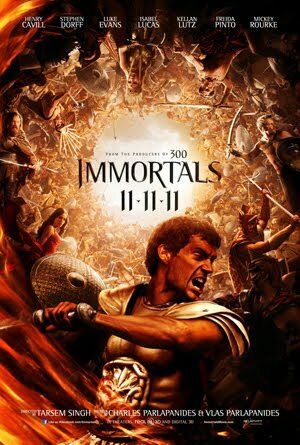 This epic action film occurs years after the Greek Gods of Olympus won their battle against the Titans, leaving them imprisoned deep within the walls of Mount Tartaros, and aching for revenge. The mortal King Hyperion (Mickey Rourke) searches for the long lost and immensely powerful Epirus Bow, intending to release the Titans and punish the God’s for failing to save his family. Once released the Titans could end mankind and destroy the Gods. As village after village becomes destroyed a young stonemason named Theseus (Henry Cavill) vows to avenge the death of his mother. He may be the world’s only hope to stop the destruction and decay. Theseus must embrace his destiny on a journey to stop a mad and brutal king from becoming the master of the world.